Kumano Nachi Shrine (熊野那智大社) is one of three Kumano Grand Shrines. There are thousands of Kumano Shrines in Japan, and it is the top of them. It is located in Nachi-Katsuura, Wakayama prefecture. The first Japanese Emperor Jinmu enshrined the waterfalls, Nachi falls, as god. Then, he traveled to Nara safely by the guidance of Yata Crow. This legend of Yata Crow is very famous in Japanese Myth. The shrine was located near the falls, and moved to current location in 317. As the one of the great historic site of Kumano, it is registered as UNESCO World Heritage Site. Nachi has been a sacred place for long time even before Japanese Myth. In Japanese Myth, the first Japanese Emperor Jinmu enshrined the waterfalls, Nachi falls, as god. Then, he traveled to Nara safely by the guidance of Yata Crow. Nachi Great Falls was enshrined as the god of life before Emperor Jimmu. Now, the waterfalls enshrines Okuninushi, and enshrines Izanami no Mikoto. The shrine was located near the falls, and moved to current location in 317. That is the beginning of Nachi Shrine. Later, it became "Kumano Gongen," Gongen is the Shinto philosophy that the god change the appearance to the body of buddha so that god can exist to our world. 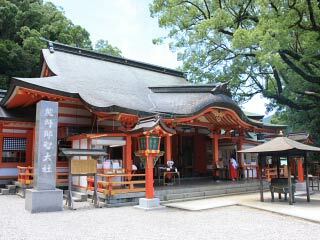 Worshipping to Nachi Shrine was already very popular in Nara Period. All people including the imperial families, nobles, samurai, and citizens worshipped from the capital to Kumano. Because the line of the prayers were continued all the way from the capital to Kumano, it was called the Kumano line of ants. The shrines are built in Kumano Style. They are registered as the national important assets. Reitaisai (Nachi's fire Matsuri) July 14.